It has been 18 days since we announced this site on Vrtpaleo List. We have had visitors from 72 countries so far, which means we have added about one country per day after our last country count announcement. Our unique visitor count has surpassed 2,000. As the map above shows, they come from all around the world with higher concentrations in North America and Europe, with many of them being repeated visitors. Thank you for your continued interest in the website. 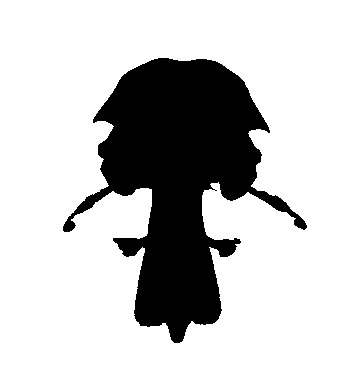 Welcome to the Silhouette Quiz! 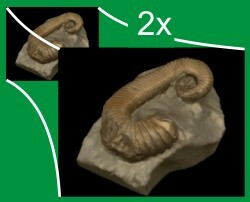 The image on the left is a silhouette of one of our specimens on display. Can you tell what it is? It is not a two-headed human statue smoking pipes. We noticed that a plugin for our Contact Form started to dislike other plugins after an update, preventing you from contacting us. We fixed it by introducing a new interface! Please let us know of your thoughts on this web site using the new contact form. We have our second round of weekly addition—Golden Eagle. 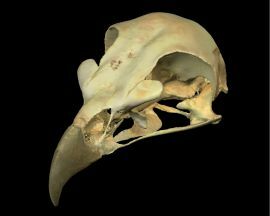 Birds are generally difficult to scan because they have narrow beaks and jugals (rod-shaped bones of the cheek), as well as thin bones that let laser pass through. This specimen was one of the easiest birds ever to scan. It is large enough but not too large as in the Brown Pelican skull that took two days to complete. It is relatively robust snouted, unlike the Common Loon skull that took another two days. A problem did surface, however, when I tried to lower the resolution of the model so that it can be transmitted over the Internet–a part of the beak started to disappear and spikes appeared. 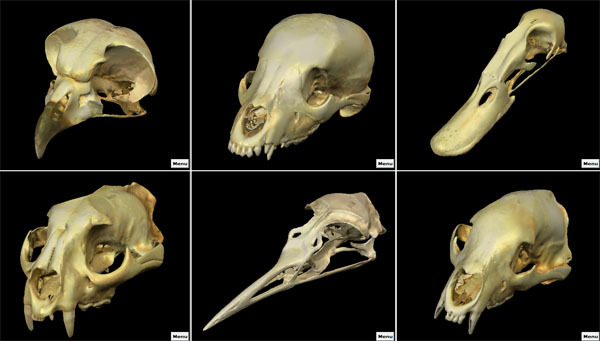 So the WireFusion model ended up with a relatively high-res beak and a low-res skull. 3DCT did a fiar job reducing the resolution without losing too much details. Here is the second set of Our Picks–we hope you like these models too. If you are a Windows user, your best morphological experience would come from viewing them through the 3DCT tab. We have our first weekly addition to the original set of specimens—Coyote Puppy. It is a cute skull. 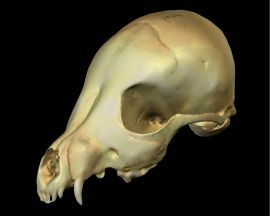 What made it difficult to scan was the canines that curve more steeply than in adults. Incisors were also difficult, as usual. As a result, these teeth are not as accurately reconstructed as the rest. We will have an adult Coyote skull on display in several weeks—you will be suruprised to see how different yet similar it is to this skull. Are you having trouble choosing what to look at? Try our picks above. If you are a Windows user, your best morphological experience would come from viewing them through the 3DCT tab. About 24 hours after we announced this web site on Vrtpaleo List, we have had visitors from 52 countries around the world! We feel bad that we only have one language option and are glad that 3D models themselves are independent of language. Thank you for visiting us, and please spread the word. The Museum of Wildlife and Fish Biology at UC Davis has provided many of the specimens that were newly added to this web site (the picture above shows some but not all of them). We would like to thank Irene Engilis, the Collection Manager, and Andy Engilis, the Curator, for their kind support. Thank you Irene and Andy! We use two competing formats for delivering 3D images over the Internet, namely WireFusion and 3DCT. 3DCT is only viewable on Windows machines but we still use this format for two reasons: (1) it excels in generating detailed yet small 3D models; (2) 85% of our visitors use a version of Windows. So if you are a Windows user, we strongly recommend that you try 3DCT images for the best morphological experience. If you install the free 3DCT Viewer, you can also view these images in PowerPoint slides (see an earlier post)—great asset for giving a lecture. WireFusion, on the other hand, is Java based so it is viewable on different operating systems, including Windows, Mac OS X and Linux. We use it as our default format for this very reason. We also like the fact that they now have a free version. Wirefusion is not as efficient in conveying detailed shape data compared to 3DCT but has many interactive fuctions that we do not fully utilize at this point. We should note that we used default compression for 3DCT, whereas we played with options within WireFusion to make the models look better (we may not be using the optimal options, however). We now have a page for FAQ. It is small now but contains such questions as "Why do pictures in menu look better than the images on my screen?". We expect the list to grow as we receive your response through Contact Us page. Specimen Cabinet was added to the web site. 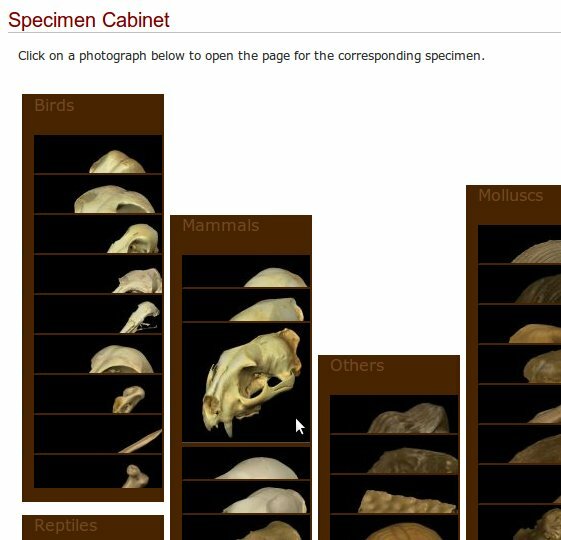 This is a tool for browsing through specimens by looking at their pictures stored in a cabinet-shaped table. Clicking on a specimen image will take you to the page that corresponds to that specimen. Enjoy!